FULL METAL SERVICE » Pimeä Metsä – New FMS full package band! Pimeä Metsä – New FMS full package band! The musical project Pimeä Metsä (“Dark Forest” in Finnish) begins in Madrid, on a 2006 December’s night. 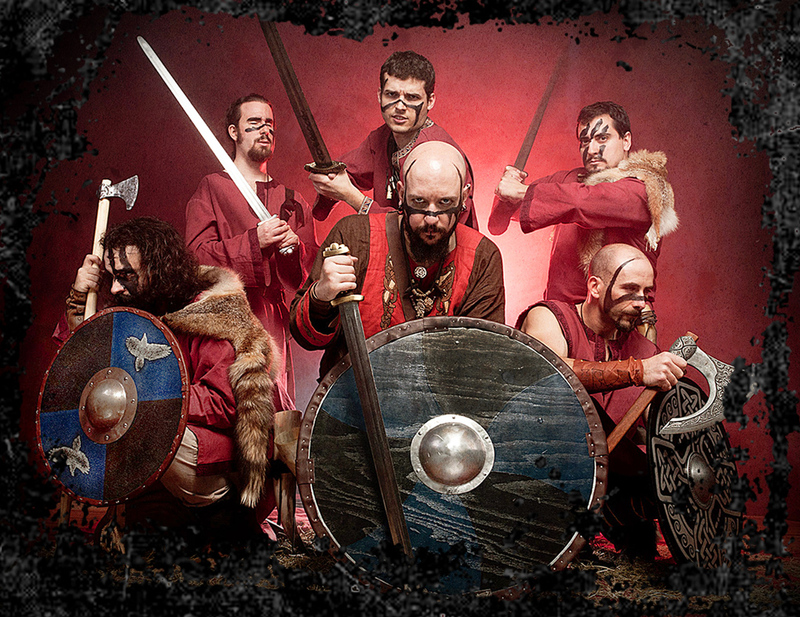 Surrounded by beer and friends, the idea of founding a northern Viking/folk metal band grew up strongly. On February 2007, David (guitar), Juan (bass) and Miguel (keyboard) started playing and composing our first pieces. As thrill and expectations grew up, we felt it was time to look for new colleagues to share our exciting adventure. While we try to find new members, Juan had to leave the band due to his studies. During those months, Pimeä Metsä was lucky to have met great musicians and friends like Vladimir, Dima, Ernesto or Antonio (bass players), Alex (vocalist) or Domingo and Laura (drummers). The current line-up starts working on July 2008, when Ángel arrived to the band as singer. The same year, in autumn, Hugo and Pablo joined Pimeä Metsä crew to take charge of lead guitar and drums, respectively. Finally, at the end of 2009, Juanto started playing his role at the bass. And the clan of the dark forest was completed. During this first period of changes and searching, the founding members of Pimeä Metsä didn’t waste time. We improved our musical skills, composing new songs and arranged the previous ones. Then, with newest incorporations playing their role, the band made its debut on 23rd January 2009 in Silikona (Madrid) for more than 170 people. Along this year, Pimeä Metsä gave other shows with Ernesto and Antonio (a good friend of David and Miguel) as live bass players. Finally, Juanto was brought in as resident bass player and gave his first show with them in Sala Live (Madrid). Our energetic shows and surprising staging gave us a good growing reputation. After several weeks of hard working, gigs and rivers of beer, the clan decided to record a demo CD. So then, “Beneath the northern lights” appears as home-made demo on February 2010 (with a little help of Dani from Canalla Records making the final mix). Thanks to this, the name of the band began to sound strongly throughout the media, getting good critics of the demo and giving the chance of sharing stage with big bands like Kathaarsys (May 2011), Arkona (June 2011, in their first visit to Spain), Korpiklaani and Trollfest (April 2012) or Northland and Ravenblood (January 2013). With a name that was known increasingly and the support of our families, friends, and fans, we decided that the time had come to record our first self-produced album at New Life Studios, in Madrid. Previous weeks of homeworking and hours of practice finished on March, 4th of 2013 with the first drums recording sessions at the studio. José Garrido and Daniel Melián are co-producers and recording engineers and the mixing will be done by Mika Jussila at Finnvox Studios. After some months of huge working, “Legacy of the Heathen North” was released as our first studio album, offering a high quality jump in production and a musical and compositional evolution. We continuing growing up as a clan, a family, to show the world the heathen spirit of the ancient gods is still alive. Welcome to the dark forest… welcome to Pimeä Metsä. See you soon at our gigs. Until then… KEEP ON VIKING!!! Komentari isključeni za Pimeä Metsä – New FMS full package band! ← D.Hate – New FMS full package member!